The Occupy Wall Street movement has been dominated by white activists, but the mainstream media has done too little to address why so few people of color have been protesting. 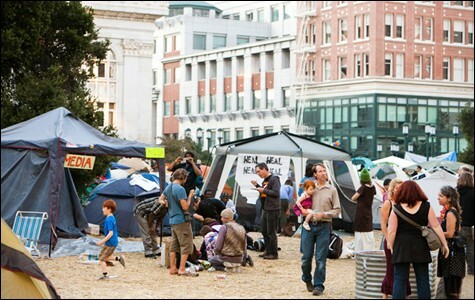 Occupy Oakland was reportedly one of the most diverse sites in the movement. This story was reprinted with permission from the Maynard Institute for Journalism Education. The mainstream media have largely ignored a key characteristic about the Occupy Wall Street protests: Most of the leaders are white and there are few people of color among the participants. By not covering this aspect of the story, media outlets are missing important opportunities to gauge the future impact of the protests and offer insight into communities of color. Answering these questions with comprehensive reporting would broaden the public's perspective on the protests as well as on minority communities: Why aren't more people of color actively engaged in this movement when minorities suffer most from the wealth gap in America? Will growth of the protests be hampered by an inability to recruit people of color? Are the solutions that the protesters seek in the best interest of minority residents? "If I were a minority journalist I would call out the fact that the racial composition of the Occupy movement is predominantly white and that journalists are ignoring the elephant in the room," said Franklin D. Gilliam Jr., a professor of public policy and political science at UCLA. "If it's about structural inequality, then how come the people most adversely affected aren't represented here? Why aren't white journalists writing about the fundamental underlying root causes of this?" Furthermore, Gilliam said that if the media want to do a better job covering Occupy Wall Street and its underlying causes, reporters need to do more than write about lack of diversity. He said journalists must ask themselves this question: "Is there a way to pivot from Occupy to find a frank discussion about the root causes of structural inequality?" Thus far, only a few media outlets have even mentioned the racial composition of the protests, and those stories don't delve deeply into the reasons or ramifications. In a piece called "Occupy Wall Street Struggles to Make 'the 99%' Look Like Everybody,'" published on October 28 on its City Room Blog, The New York Times cited a Fordham University survey taken from October 14 to October 18 at Zuccotti Park. The survey found that 68 percent of the protesters were white, 10 percent were black, 10 percent were Hispanic, and 7 percent were Asian. While The New York Times piece noted the limited number of diverse protesters in the movement, it did not attempt to answer the broader questions about race and the protest. What's clear, however, is that the Times and other media outlets could report on these themes simply by reaching out to more diverse sources. Victoria DeFrancesco Soto, a visiting scholar at the University of Texas at Austin, said that "it's especially ironic that blacks and Latinos" aren't represented as much as whites in the Occupy movement, given that they have weathered enormous setbacks during the economic downturn, including soaring rates of unemployment and foreclosures. Latinos, Soto pointed out, reportedly lost more wealth during the recession than any other demographic because the majority of their wealth was tied to the equity in their homes. That being said, Soto says, the political participation by minorities "is a function of resources, whether that's voting or having the time to go to a march. It's hard to go out and occupy if you're working a job at KFC and babysitting your sister's kids." William Winters, economic justice organizer for Change.org, an organization that promotes petitions created by the public to influence decision makers, is concerned that more diverse crowds haven't turned out at Occupy events. But he said the goals of Occupy Wall Street are consistent with concerns in communities of color. Winters noted that banks have invested in private prisons, fueling the prison industrial complex that has led to massive incarceration of blacks and Latinos, and minority groups should welcome the scrutiny of these financial institutions. However, if the media doesn't report on these issues and the numbers of blacks and Latinos at Occupy events remain small, there's concern that such issues "are going to continue to exist at the margins," Winters said. If news outlets had paid more attention to the predatory loans that banks gave to black and Latino homebuyers in the early part of last decade, "the media could have played a role in heading off what became a huge meltdown," Winters said. For its part, Time magazine did note the predatory relationship between banks and communities of color in the recent article "Is Occupy Wall Street Too White?" Winters suggested that the media can highlight the financial issues in minority communities by interviewing and profiling the people of color participating in the protests. He helped promote a Change.org petition about police brutality at Occupy Oakland launched by a black woman. 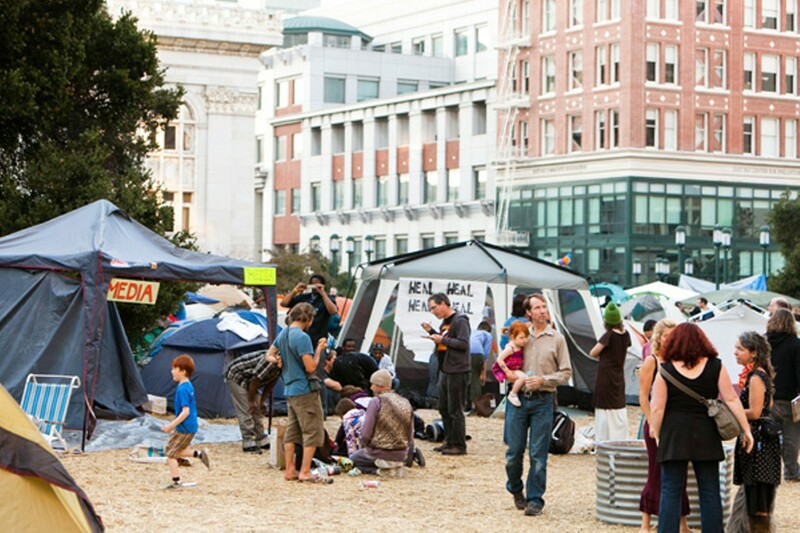 Occupy Oakland is said to be one of the most diverse sites of the movement, with whites, blacks, Asians, and Latinos all taking part. The MSM also has largely missed the fact that the protest has spurred some minority groups to become engaged in the movement. Minority activists formed New York-based groups, Occupy the Hood and the People of Color Working Group, which are mobilizing people of color to participate. Thus far, mostly minority media and websites are reporting on their activities. A month ago, when Chloe Hilliard, editorial director of website TheLoop21.com, saw a Tweet about Occupy the Hood, she jumped at the chance to profile them on her site. The story served two functions. It highlighted the efforts of people in the inner city participating in Occupy Wall Street and also served as a way for TheLoop21's readership to take interest in the movement. Hilliard said that urban audiences may not connect to language such as "the 99 Percent" but are more likely to take an interest in the Occupy movement from a human-interest standpoint. "It's hard to tell someone who is unemployed or who can barely pay their rent to start pontificating about the economic reasons the country's in the recession," Hilliard said. "They can't stop their life to analyze that." Hilliard said that conversations from people of color about Occupy Wall Street are growing among Facebook and Twitter audiences, so she advises journalists to review those posts to learn more about how people of color feel about the protest. Moreover, the media can learn more about how communities of color feel about the protest by contacting minority organizations. For instance, the black political group, ColorofChange.org, is surveying its membership about Occupy Wall Street. The group's campaign manager, Dani McClain, said that much of the membership supports the Occupy movement, but some have indicated that they do not feel comfortable sleeping outside in tents. "Just because the images are of mostly young white people doesn't mean the concerns that are being raised aren't reflective of people of color," she said. "I think this general desire to see higher accountability among our banks and our financial institutions is definitely a concern that black people have." It's interesting that right-wing commentators, such as Rush Limbaugh and Michelle Malkin, have been quick to attack the protests by saying that the Occupy movement doesn't represent most Americans. But now the mainstream media can do a public service by explaining why.